Great news for new-music fans on Long Island: the program for the concert January 4 at Long Island University’s Tilles Center for the Performing Arts has been changed to allow the audience to hear Magnus Lindberg’s Piano Concerto No. 2 with Yefim Bronfman as soloist. Tchaikovsky’s emotion-packed Fifth Symphony and Christopher Rouse’s Rapture round out the program. “Brilliant and triumphant … I look forward to hearing it again,” said The New York Times after Bronfman’s premiere performance of the concerto in 2012 (see photo, with, from left, Alan Gilbert, Bronfman, and Lindberg). Now you can, at the Tilles Center and at Avery Fisher Hall at Lincoln Center January 2, 3, and 7. The Philharmonic’s recording of the World Premiere of Lindberg’s Piano Concerto No. 2, featuring Yefim Bronfman and conducted by Music Director Alan Gilbert, is nominated for two Grammy Awards: Best Classical Instrumental Solo and Best Contemporary Classical Composition. The Philharmonic’s former Marie-Josée Kravis Composer-in-Residence, Magnus Lindberg composed the concerto, co-commissioned by the Philharmonic, for Mr. Bronfman, the Philharmonic’s Mary and James G. Wallach Artist-in-Residence. Post-Hercules Update: As of now, this concert will go on as scheduled. The New York Philharmonic's recording (distributed by Dacapo) of the World Premiere of Magnus Lindberg's Piano Concerto No. 2, featuring Yefim Bronfman and conducted by Music Director Alan Gilbert, has been nominated for two Grammy Awards: Best Classical Instrumental Solo and Best Contemporary Classical Composition. The Philharmonic's former Marie-Josée Kravis Composer-in-Residence, Magnus Lindberg composed his Piano Concerto No. 2, co-commissioned by the Philharmonic, for Mr. Bronfman. 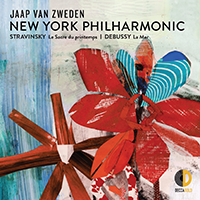 The album is available for purchase from the New York Philharmonic’s e-store, Amazon, iTunes, and other music retailers. Yefim Bronfman, the Philharmonic's current Mary and James G. Wallach Artist-in-Residence, will reprise the concerto with the Philharmonic and Alan Gilbert January 2–3 and 7, 2014.